Throughout the past few weeks, I have been researching a topic that I dreaded – insurance. Now, don’t get me wrong, insurance is important. And through doing this research, I have realized that insurance is more important than I knew. In fact – it may be the most important part of your trip. The most popular type of travel insurance is comprehensive travel insurance, which includes everything that happens prior to your trip and covers everything on your trip that is non-refundable. As a general rule, the price of this insurance is about 10 percent of the cost of your trip. 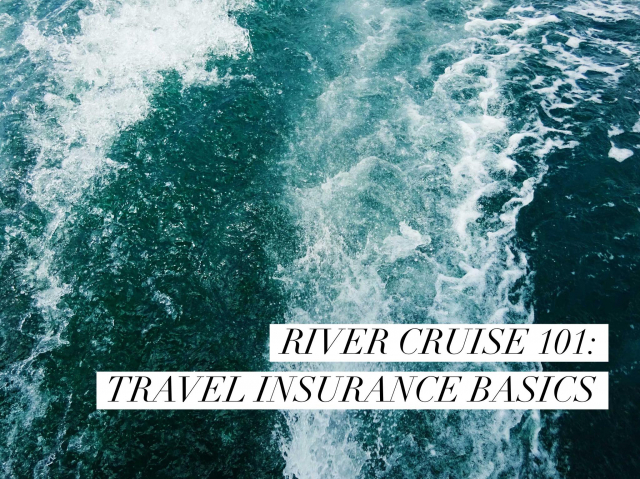 So, if your cruise costs US$5,000, the insurance would cost you around US$500. However, if you choose solely a medical plan or some other type of insurance, the cost will likely be less. I am a firm believer in the saying, you’re better safe than sorry. Plus, I always anticipate the worst in situations. So why have I never thought about travel insurance? Simply put, nothing has ever gone wrong. I have never had an emergency that would cost more than the price of insurance. That will change now that I’ve heard some of the stories of what could go wrong – and how much I could be liable for. Travel insurance can also help in case of injury or illness, especially in remote areas (in North America, the remote regions of Alaska are among the most expensive places for evacuation). Travel insurance will cover the cost of airlifting passengers and transporting them to a hospital. Most travel insurance covers those expenses up to a quarter of a million dollars. Suzanne Morrow from InsureMyTrip tells us that illness and injury are the top reasons for purchasing insurance by cruisers. Medical issues also drive the majority of most insurance claims. Although travel insurance can cover a multitude of problems, there are certain things that we may not take into consideration. For example, in my interview with Morrow, things got a bit dark. We talked about what may happen in case of a death while traveling. Deaths may occur on the ship or ashore, and there are costs associated with retrieving the body and getting it back to the family. Through InsureMyTrip and other insurance companies, guests are also able to buy “cancel for any reason” insurance, which gives guests the option to get their money back if they decide they do not want to go on their trip. When I asked about some things that are covered that travelers may not think about, Morrow mentioned port of call changes, itinerary, or excursion cancellations. So what should you do if you decide to get travel insurance? Insure your first deposit within 14 days of making the first payment. Do research on which insurance company is going to meet your needs. Call the insurance companies to ask questions. Be sure that your insurance policy is covering what you want it to cover, which Morrow says should be everything on your trip that is non-refundable. Be wary of policies offered by airlines and similar companies. Airline policies are limited coverage, and ticket protection is not a comprehensive plan. Do you need travel insurance? The choice is up to you. But after doing this research, I don’t know that I will travel again without it. Be sure to come back in the following weeks to learn more about the specifics of travel insurance and different types of travel protection. What experiences have you had with travel insurance? Do you have additional insights for our readers or a story to share?